In the Near Northside Action Plan developed through Mayor Turner’s Complete Communities Initiative, residents established three mobility and infrastructure goals: build great streets, improve neighborhood mobility, and expand bike lanes and facilities. 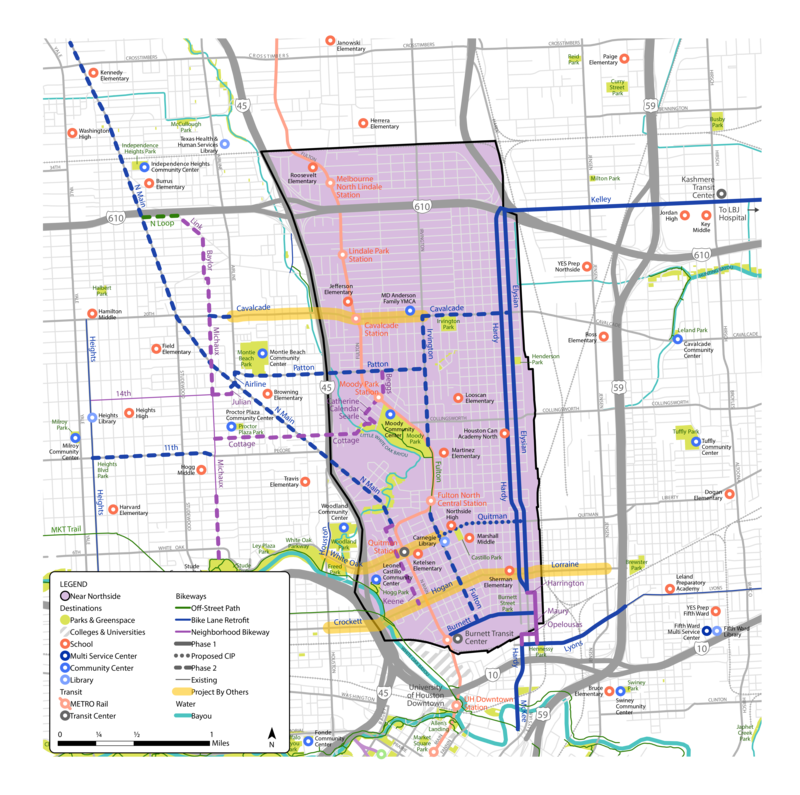 The proposed bikeway network under the city-county partnership seeks to meet each of these goals by improving on-street bicycle infrastructure, creating safe intersection crossings for bicyclists and pedestrians and connecting residents to major destinations within and around Near Northside. The City of Houston Planning and Development Department has met with and will continue to meet with Near Northside community members to discuss proposed bikeways. Phase 1 represents routes that passed a preliminary feasibility analysis. Phase 2 are bikeway routes also identified by the community, but are not feasible to implement by April 2019, as they are long-term projects. Proposed CIP are projects the City of Houston seeks to complete using Capital Improvement Program funds. The yellow highlighted segment, Project by Others, indicates that there are plans to improve street and bike infrastructure in that area by either the City of Houston or an entity outside of the City of Houston.